The dawr was the pillar par excellence of the waṣla during the Nahḍa period, and “the most eagerly awaited for passage since the beginning of the waṣla because it is easy to understand and has a rich melody” as stated by Muḥammad Kāmil al-Khula‘ī. The dawr as a vocal form is not the same as the dawr as a term. The latter means a part of another form, i.e. a part of the muwashshaḥ for example, or a part of the dawr’s form itself. The muwashshaḥ includes adwār and khānāt while the dawr includes a madhhab, and a dawr or more. Up to the mid-1800s, the form of the dawr included a madhhab, and a dawr (or ghuṣn) or more. All of which usually followed the same melody. In principle, the madhhab was sung with the biṭāna (choir) and repeated after each dawr, whereas the adwār or the aghṣān were sometimes performed as improvised interpretations (tafrīd) inspired from the same melody. Let us now listen to an example illustrating this stage: dawr “Yā ḥlēwā yā msallīnī” attributed to Sheikh Muḥammad ʻAbd al-Raḥīm al-Maslūb and sung by Muḥammad Sālim al-Kabīr. 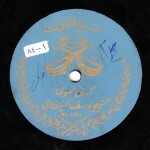 It was recorded by Gramophone around 1918 on both sides of a 25cm record, order # 7-212166 and 7-212167, matrix # 5896 AK and 5897 AK, with the takht of Sāmī Afandī al-Shawwā, Muḥammad Afandī al-‘Aqqād and Ibrāhīm Afandī al-Qabbānī. In the second half of the 19th century with the Nahḍa (Renaissance) school starting with ‘Abduh al-Ḥāmūlī and Muḥammad ‘Uthmān, this form was developed: before the Nahḍa, the madhhab used to be extended and not repeated. With the Nahḍa, new additions were brought to the dawr. The dawr then became formed by several stages starting with the tafrīd –a type of istirsāl i.e. improvisations inspired from the madhhab. This constitutes the fixing of what was only possible in the old form of the dawr if the performer so wished. The tafrīd was followed by the waḥāyid: another type of improvisation, a dialogue this time, built on a responsorial between the first singer and the biṭāna or the madhhabjiyya. The main frame of the waḥāyid is either a pre-composed structure to which the singer brings new ornamentations of various degrees and conducts a dialogue with the madhhabjiyya, or improvised in full. The waḥāyid element is divided into two parts that do not necessarily follow one another according to a fixed order. One of these two parts is sung with the lyrics of the dawr and follows a question-and-answer pattern: it is a dialogue between the solo singer and the biṭāna. The second part follows a responsorial pattern too, but its lyrics are not those of the dawr. They are a type of tarannum or henk: either āhāt, layālī, or both. The singer concludes his performance with a long-breath melodic passage signaling the end of the waḥāyid. He joins the madhhabjiyya in singing the conclusion: a pre-composed phrase that is either inspired, or more often a repetition of a part of the madhhab, or a totally new phrase. This is the form of the dawr when sung with all its parts. It was not an essential condition, at least not in the adwār of the Nahḍa’s first generation. The performer was only bound by the madhhab. 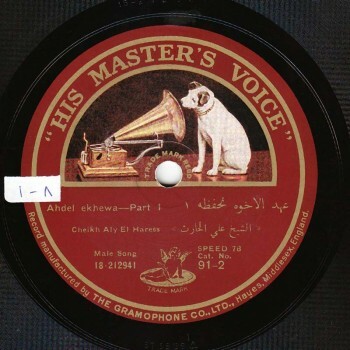 Let us now listen to an example illustrating this form: dawr “ ʻAhd el-ekhewwa” sung by Sheikh ʻAlī al-Hārith. The madhhab was composed by ‘Abduh al-Ḥāmūlī to the bayyātī maqām. 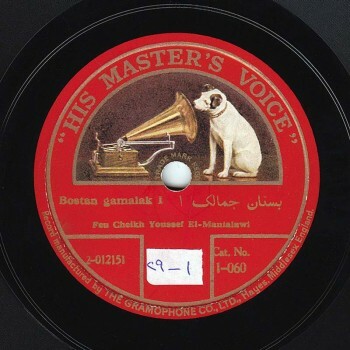 It was recorded by Gramophone around 1928 on both sides of an electric-power printed 25cm record, order # 18-212941 and 18-212942, matrix # BT 3859 and BT 3860, with the takht of Muḥammad Afandī al-‘Aqqād (qānūn), Sāmī Afandī al-Shawwā (kamān) and Maḥmūd Afandī Raḥmī (percussions). The example we just listened to is characterized by the simple melody of the madhhab and the total freedom in the performance of the dawr. 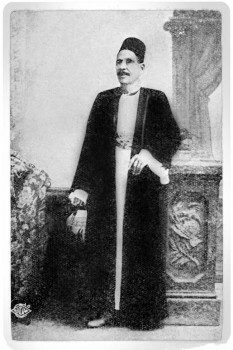 This is what made the style of ‘Abduh al-Ḥāmūlī so distinctive from the style of his fellow-singer Muḥammad ‘Uthmān who chose richer and more elaborate melodies and worked on developing the dawr in order to make it more intertwined and complex. Yet, the value rendered by the beauty of Al-Ḥāmūlī’s simple style is no less than the value of the efforts of ‘Uthmān on improving this art, both styles inducing salṭana. 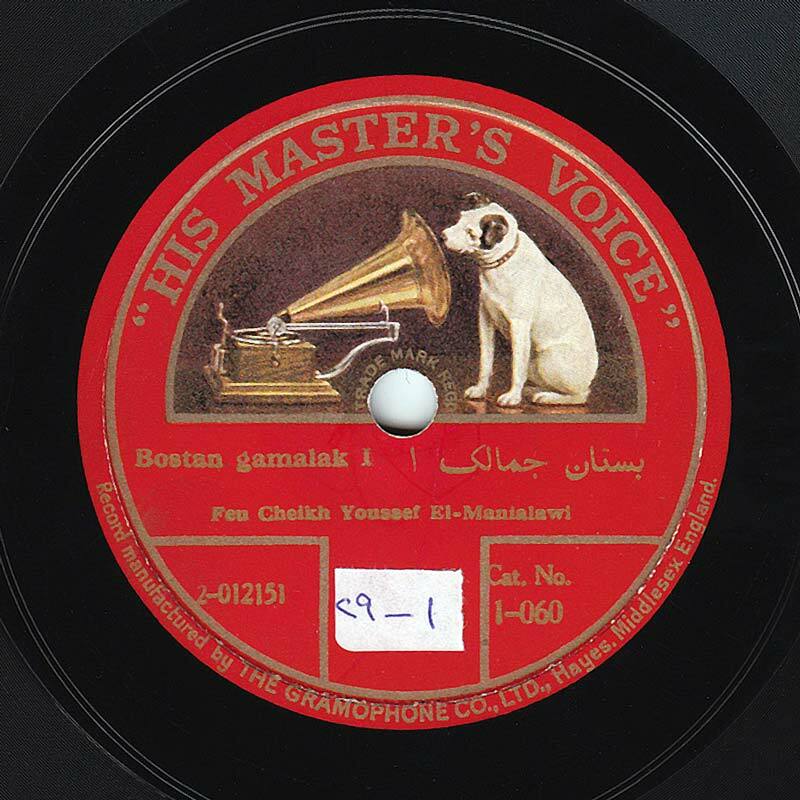 We will now listen to dawr “Bustān gamālak” composed by Muḥammad ‘Uthmān and sung by Sheikh Yūsuf al-Manyalāwī, recorded by Gramophone in 1907 on both sides of a 30cm record that was only published later by “His Master’s Voice” –daughter company of Gramophone–, order # 2-012151 and 2-012152, matrix # 1159 C and 1160 C, with the takht of Muḥammad al-‘Aqqād (qānūn), Ibrāhīm Sahlūn (kamān), ‘Alī ‘Abduh Ṣāliḥ (nāy) and Muḥammad Abū Kāmil al-Raqqāq (percussions). The Nahḍa’ school did not only affect its contemporaries and their successors. It also affected the teachers of this school’s founders. 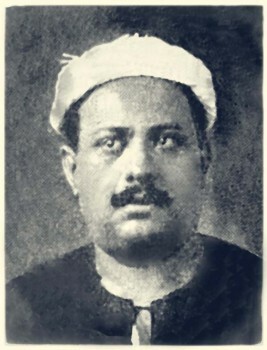 Muḥammad ʻAbd al-Raḥīm al-Maslūb –we have previously listened to a sample of the tunes attributed to him– surprised the music amateurs, musicians and audiences alike, with a dawr that does not only include the elements developed by the followers of the Nahḍa school. He added to their changes a rhythmic cycle nobody had ever thought to use in a dawr: the aqṣāk rhythm (9 pulses). In a dawr, the common rhythmic cycle of a madhhab was the maṣmūdī kabīr (8 pulses) while the dawr was composed to the waḥda (4 pulses). The rhythmic cycle may change to the maqsūm or to any other 4-pulse rhythmic cycle during the performance of the waḥāyid, whether the madhhab and the dawr are composed to the aqṣāk rhythmic cycle or not. This had never happened before ʻAbd al-Raḥīm al-Maslūb’s dawr. We will now listen to this dawr “Fī zamān el-waṣl”. Note that the unprepared improvised tafrīd composed to such a rhythmic cycle is not an easy task for those who were not used to it and who limited their tafrīd and improvisations to both the mursal (of non-metric measure) and the muwaqqa‘ forms to the 4-pulse waḥda. Let us go back to dawr “Fī zamān el-waṣl”. Despite its great fame, we were only able to find two recordings of it. This only indicates the dread of musicians as to performing and recording this dawr. One of these two recordings is by Sheikh Yūsuf al-Manyalāwī, and the other by Zakī Afandī Murād –the more recent one which we will listen to now. 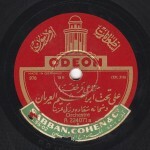 It was recorded after WW1 by Odeon on both sides of a 27cm record, order # X4 5996/ 1 and 2, matrix # Ex 2505/ A and B, with the takht of Sāmī Sāmī al-Shawwā (kamān), Muḥammad ‘Omar (qānūn) and Maḥmūd Raḥmī (percussions). We have come to the end of our first episode about the dawr. We will resume discussing this subject and listening to recordings illustrating the different forms and stages of the dawr in the next episode of “Our Musical System”. This episode was brought to you by Muṣṭafa Sa‘īd with the collaboration of Ghassān Saḥḥāb.